Terence McKenna once told a story in one of his recorded lectures that I like very much. It is the idea that humanity is created by an advanced alien civilisation long time ago with a very specific purpose. Somewhere in the future these aliens will visit our planet again, with big space ships, to harvest all the gold and other rare metals that humanity has been digging up and collected for centuries. The idea that humanity is some cosmic ant species always makes me smile when it pops up in my mind. The whole idea of collecting is absurd anyway. In the light of the fact that you cannot take it with you when you die, it is difficult to understand why humans are so obsessed with collecting. I know several people who ruined their life and relations because of their collection. Collectors of records and books tend to see themselves a bit different from collectors of miniature elephants or Jesus statues, because they can say that books and records can be used. But I know too many people with tonloads of books and records that are never read or listened too. Collecting is a mental disease. And the idea that aliens built this behaviour in our genes is not as farfetched as it may seems, although it is complete nonsense of course. 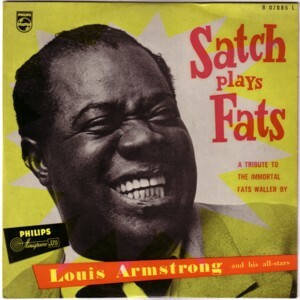 Somewhere on a shelf I keep about 30 LP’s of Louis Armstrong. They were given to me by the second wife of my father, just before she died. I am no big fan of Louis Armstrong, but I have not done these records away yet because it was a gift from a person who wanted her records taken care of after she died. The covers of some of the LP’s are beautiful, and some of the records are old and look pretty interesting. I have no idea if they are worth any money. Every now and then I take out an LP and put it on my record player. But I just don’t have any relation with this kind of music. There is some jazz that I do like, and it is obvious that Louis Armstrong is a great musician, but it is not my cup of tea. I have began making a compilation CD from all the LP’s several times, but I never found more than a handful of tunes that I found worth re-listening. Now that I have to find space for the records that I got from Alex Sas, I think I will have to get rid of my Louis Armstrong collection. Anybody interested? 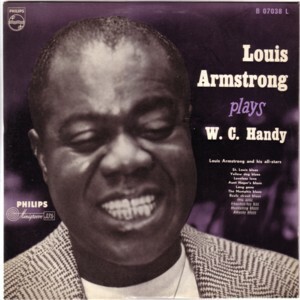 here is Louis Armstrong, not from one of these LP’s, but from a 45 that I once bought. You know everytime you say: “Come and get it!”, “Anyone interested”, I tend to react just out of greediness. The fact is – in my opinion that is – I think your right. Aliens invested us with these longings of heving more and more. More or less the same as the story of Sinterklaas. I know people who give their child a present everyday from the moment the geezer gets ashore. That’s around 21 presents without counting the presentsnight on December 5th. People want more and more, it’s like Economics, if you make the same profit you made last year, it was a bad year for the company. On the other hand, the aliens are coming back to collect the gold and other valuable things we thought we were collecting, so ehm… Yes! 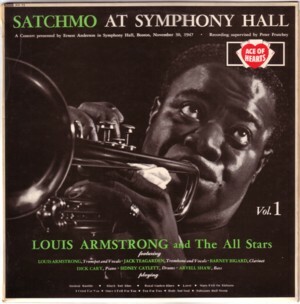 I’m interested in Louis Armstrong! How much? What do you want me to do?